Our Second International Meeting for Science in Palestine ended this Sunday at Columbia University, NY, USA. We are tremendously grateful to everyone who took the time to participate. The weekend was an incredible success and it was beyond wonderful seeing so many people, coming from different backgrounds and sharing different skills, all working towards the same goal: developing innovative visions to support and advanced the integration of the Palestinian scientific community into the broader international community. Because of the incredible success of the conference, we had to face some exceptional expenses and we are currently $ 1150 dollar short. That is why we have raised our fundraiser goal from $ 5000 to $ 6150. If you haven’t donated yet, and you have money to do it, please consider donating to support our activities, share the fundraiser and ask your friends to support. No donation is too small! If you missed the meeting you can watch the recordings of the events on our Facebook page, direct links to the various sessions are available here. Friday’s public event was streamed live, and can be seen here. The meeting’s sessions are being streamed live on our Facebook page. The first session is here. The second International Meeting for Science in Palestine will start soon at Columbia University, NY, USA. The meeting starts this Friday at 5:30PM with a public event on Doing science under military occupation: the case of Palestine. The rest of the weekend is for registered participant only, but we will try to live-stream the meeting – more information will be posted here and on our facebook page. You see the full program here. 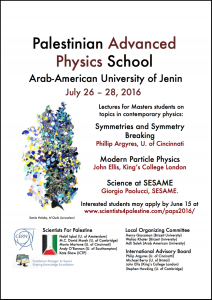 The program of the Second International Meeting for Science in Palestine is now available here. The meeting will open with a public event on Doing science under military occupation: the case of Palestine. The meeting will continue on Saturday and Sunday with sessions for registered participants only. We will hear updates from Palestinian academics on their research along with the challenges they face to carry it out. The meeting will be a unique opportunity to connect with concerned scientists who are willing to work to help build connections with Palestine. Applications are still open for the Second International Meeting for Science in Palestine, the event is for registered participants only. If you would like to participate please don’t forget to fill out the application form here. The application deadline is October 30th 2018. 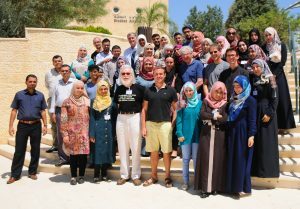 Scientists for Palestine is raising funds for the Second International Meeting for Science in Palestine, and we need your support. $ 3400 will go towards reimbursing visa and travel expenses for Palestinian scientists. $ 1000 will go towards meals during the event and one social dinner. $ 600 will go towards advertisment and extra expenses. From November 9th through 11th, 2018 Scientists for Palestine and many other members of the international scientific community, will gather at Columbia University in the City of New York for our Second International Meeting for Science in Palestine, a weekend-long meeting involving multiple plenary and parallel sessions. The goal of the workshop is to reaffirm our vision and establish new and ambitious objectives for scientific collaboration between the Palestinian and the international community, transcending the limitations caused by 50 years of ongoing occupation. 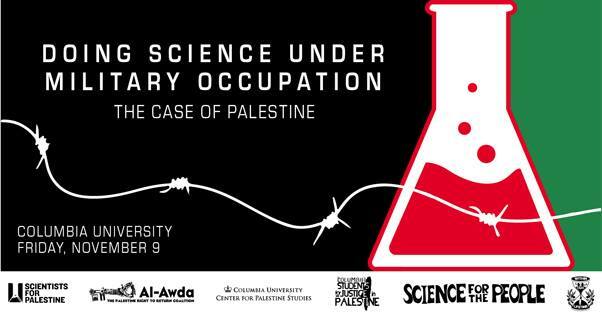 From November 9th through 11th, 2018 Scientists for Palestine and many other members of the international scientific community, will gather at Columbia University in the City of New York for a weekend-long meeting involving multiple plenary and parallel sessions. The event is co-sponsored by the Center for Palestine Studies at Columbia University, Columbia Students for Justice in Palestine, Science for the People and Within our Lifetime • United for Palestine. This will be Scientists for Palestine’s second international gathering, after a similar initiative hosted earlier this year at the University of Cambridge, UK. The event is only open for registered participants, if you would like to participate please fill out the application form. The application deadline is October 30th 2018. Up to date information will be available in the gathering’s webpage, and on the Facebook event. Participants are expected to make their own travel and accommodation arrangements. Lack of funding for Palestinians pursuing their studies, both at home and abroad, is a considerable obstacle for the advancement in their careers. Opportunities for scholarship exist (gathered here) but they can be narrow in scope. We thus decided to advertise individual fundraising campaigns created directly by Palestinian students in order to support their studies here. We are pleased to announce that our website has a new section collecting important information about a wide variety of funding opportunities for Palestinian students and academics. In particular, there are now links to various scholarships for students. We are committed to keep this section as update as possible hoping this list will keep on growing. If you know of any funding opportunity which you think could be useful but that is missing, let us know filling out our appropriate form. It only takes a couple of minutes! We are now currently working on expanding the section to also include information about different summer schools, as well as research grants relevant for Palestinian academics. 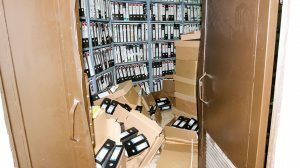 We are collecting information on funding opportunities for Palestinian students and academics, and to develop our activities (for example to organize scientific schools in Palestine, exchange programs for Palestinian students, funding opportunities for Palestinian students to study abroad, supporting media project to talk about the impact of the Israeli Occupation on education in Palestine). If you know of any funding opportunity that might be useful please take a moment to share it with us here. We plan to compile some of this information to make it publicly available on our website. Applications are now open for our first International Meeting for Science in Palestine, to be held in Cambridge, U.K., from January 5th through 7th, 2018. This will be the first international gathering to discuss how to implement concrete programs and long term visions to strengthen the growth of science in Palestine and help build ties between the Palestinian and international scientific communities. The target audience is a mix of Palestinian academics and students, and of international scientists committed to advancing these goals. For more information visit the meeting’s website here. Four students from Gaza were forced to remotely participate to PAPS 2017, the second Palestinian Advanced Physics School at Birzeit University as they were denied travel permits to attend the school. The restrictions imposed by the Israeli government are so strict that even delivering the physical certificate to them was not easy. Thanks to Dr. Wafaa Khater and Dr. Badran, from Birzeit University and to Dr. Sulaiman al Barakeh from Al Aqsa University in Gaza, they were able to obtain a more than a well deserved certificate recognizing their work. 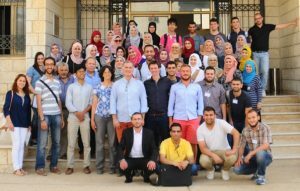 The 2017 edition of the Palestinian Advanced Physics School, hosted by Birzeit University, ended on July 13th. We are happy to say that the school was a great success! The incredible success of the school would not have been possible without the support of the International Center for Theoretical Physics (ICTP), our local Palestinian support and the over two-hundreds donors who have contributed with small and large donations to raise the funds to make this event a reality. There are no words to thank you enough! Visit our facebook page for more photos of the school and for videos of the lectures. Unfortunately due to reasons beyond our control the school can longer take place at Al-Quds University and will instead take place at Birzeit University. The dates and speaker list remain unchanged (available here). Applications are now open for the school, interested students can apply by June 10th here.